Bogor (Indonesia), April 12, 2017 — Protecting peat from forest fires and restoring degraded peatlands are complex processes that require solid science. 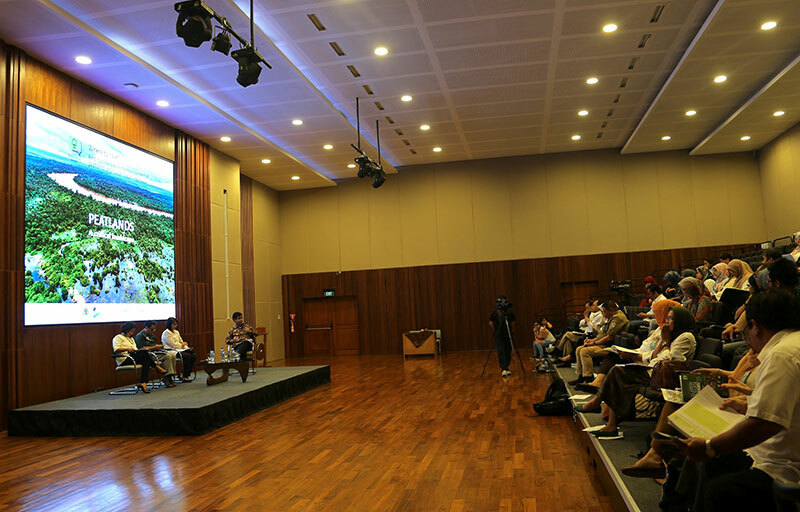 In an event held in Bogor, Indonesia, on April 12, experts from the Center for International Forestry Research (CIFOR) and the Research, Development and Innovation Agency of the Indonesian Ministry of Environment and Forestry (FOERDIA) shared their knowledge related to the management of peatlands and forest fires. Both research institutions analyzed the effectiveness of policies and implementation following the fire and haze event in 2015. Looking forward, CIFOR and FOERDIA discussed how to advance science that supports policy for peatland protection and restoration in Indonesia. In particular, they debated how to monitor progress on peatland restoration; how to reconcile the differing figures and maps for peatlands; and how to measure the effectiveness of existing regulations, such as presidential decree PP 57/2016 on sustainable peat management. The multiple dimensions of peatlands protection and restoration are part of the areas of research of CIFOR and FOERDIA. Both institutions have collaborated since 1997 and will continue to work together to connect research with policymaking and implementation in a way that triggers action. This discussion comes ahead of the second Partners Meeting of the Global Peatlands Initiative meeting and the Global Landscapes Forum: Peatlands Matter event. These two global events related to peatlands will take place in Indonesia in May. Peatlands are important carbon sinks and stocks, estimated to hold more than 600 Gt of carbon. When drained, they are especially susceptible to fires. At the same time, millions of farmers derive their livelihoods from unsustainable agricultural practices on these lands. The fire and haze event in Indonesia in 2015, which produced 15% of the world’s carbon emissions that year over several weeks, caused billions of dollars in economic losses and created a public health crisis, bringing these conflicting issues to the forefront of global attention. Photos of the event (on demand). HD footage of peatlands and field research (on demand). CIFOR advances human well-being, equity and environmental integrity by conducting innovative research, developing partners’ capacity and actively engaging in dialogue with all stakeholders to inform policies and practices that affect forests and people. CIFOR is a CGIAR Research Center, and leads the CGIAR Research Program on Forests, Trees and Agroforestry (FTA). Our headquarters are in Bogor, Indonesia, with offices in Nairobi, Kenya, Yaounde, Cameroon, and Lima, Peru. This event is supported by CGIAR Fund Donors.